This article was re-posted with significant updates on February 29, 2012. A big thanks goes to Captain Finney for historical and technical corrections. Additional thanks goes to some Aussie and Canadian friends. I seem to see Whitby and Brewers everywhere these days and have been fine tuning my identification skills to pick between the three versions: 42’s, 12.8’s, and 44’s. I was kayaking the Fruit Isles in Fort Lauderdale the other day and passed by the nice 12.8 in the featured photo below. I like her dark green hull color. The easiest one to differentiate is the Brewer 44 ostensibly the subject of this review. But you cannot talk about one without touching on the others, so if you are in the market for a 42 or 12.8, this article should include useful information too. Kurt and Doris Hansen of Whitby Boatworks in Ontario, Canada were the first to build these sailboats. They commissioned Edward S. Brewer & Associates to design her in 1972. The first Whitby 42 splashed out of their yard in 1973. The Hansens went on to build over 200 hulls from 1973 to somewhere around 1990. Previous to this, Whitby Boat Works had built the Alberg 30 and Alberg 37. In around 1980, the Hansens commissioned Fort Myers Yacht and Shipbuilding Inc on the west coast of Florida to build Whibys because they could not meet the exceptional demand. They trucked an old mold from Canada. The Fort Myers Whitbys were casually called Florida Whibys. 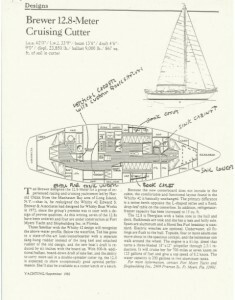 In 1983 a consortium of sailors led by Harold Oldak from the Manhasset Bay area of Long Island, New York decided they wanted their ultimate cruising boat. They settled on a Whitby 42 with 100 changes (Yachting, 1983). The most important change to the new mold was the “Brewer bite” keel with a skeg mounted rudder to improve her light air performance. The changes were approved by Ted Brewer. The consortium asked Kurt Hansen if he would build the boat to their revised design. Kurt Hansen said no, that would make the boat too expensive. The Long Island group went to Fort Myers to see if they would build the boat. The partners at Fort Myers were delighted to build the new design since that would give them design authority, something they did not have while building Whitbys. 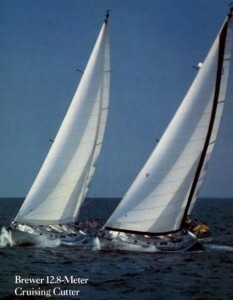 The Brewer 12.8 was born in 1983 and the first eight hulls were identical. Whitby hull numbers 1 to 199 were reserved for Canada while 200 and up were assigned to Fort Myers. When the Brewer 12.8 was built, they simply continued with the same hull numbers. Fort Myers Whitbys were hull numbers 200 to approximately 233. Then the 12.8’s were approximately 234 up to approximately 280ish. In 1987 the company introduced a swim platform extended Brewer 44 which they produced until 1990. During the time that 12.8’s were built, some buyers wanted the Whitby design or parts of both. Since Fort Myers and Canada were no longer on good terms, these boats built in Fort Myers were called Brewer 42s. To summarize, the Whitbys were ketch rigs with a full keel. The Brewer 12.8s were cutter rigs with double spreaders, a cutaway fore keeel with skeg mounted rudder. Some had tall rigs with the mast coming right through the center of the main salon and an anchor platform forward while others had standard rigs with the mast against the forward bulkhead and a bowsprit. The Brewer 44 is the same as the 12.8 except they moulded on a swim platform and enlarged the aft cabin slightly. Some Brewers and Whitbys are double head stay ketches. This rig is the term Ted Brewer likes to call what some would call a cutter ketch. Brewer’s Pacific Northwest inspired designs many times have a more rugged look than the typical Northeast yachtsmen lines. Her bow is rather blunt, freeboard is above average. She has a raked bow, Ted’s trademark springy sheer, and a flat transom on all except the 44 which features a swim platform. The 44’s swim platform is glassed onto the same hull mold with the “Brewer bite” as the 12.8’s and is simply a small ledge. The teak lined combings and toerail put her squarely in the 1980’s and give her classic charm. The cockpit combings curve outward and integrate nicely into the cabintrunk. Underneath the underbody varies from the full keel of the Whitby’s to the long keel and skeg hung rudder on the Brewers. The Whitby’s came with fixed keels of 5′ 2″ draft while Myers boats are mostly centerboards with 4′ 6″ up and 9′ 3″ down draft. Aloft the Whitby’s were ketches and so are some 12.8’s while the 44’s are cutters. For locals of Lauderdale if you ever have had lunch at “Le Tub” in Aventura, you might be interested to know that the manager owns a Whitby 42 and not just any 42. “Spectacular” as she is called has bright yellow canvas and a lime green cove stripe! The Fort Myers versions are reportedly better constructed than the sometimes questionable build techniques of Whitby. The most annoying Whitby build issue was their early use of pop rivets to fasten the internal flange of the hull to deck joint though later stainless steel bolts became standard. The topsides are balsa cored between alternating layers of mat and woven roving glassed together with polyester resin. The deck is also balsa cored with a keel stepped main and deck stepped mizzen. The ballast is internal lead. For the Myers versions, Ted Brewer added 500 additional pounds of lead ballast for 9,000 pounds with the same 23,500 pound displacement. They re-engineered her with lighter and stronger construction techniques and switched to a double spreader main on most 12.8’s. 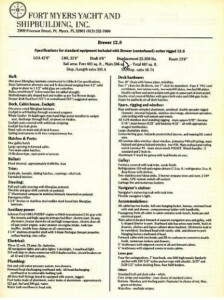 Original specifications list Gibbs & Cox as the engineering standards. Brewer 12.8’s were made in different configurations, and while you can try it is hard and a bit unfair to pigeon hole some “real” 12.8. A ketch rig is posible. Keels can be centerboards or fixed at 5′ . Hardware varied from plastic to stainless portholes, etcetera. Like many manufacturers it seems that build quality improved from 1983 to 1990 as the Fort Myers yard became more experienced. Problems are well documented online on the chatboards and in print. Problem areas include bilge tanks, joint leaks, and weakness around the mizzen compression post. The deck hardware noticeably varies between Whitby 42’s, Brewer 12.8’s, and Brewer 44’s. The Whitby’s are less expensively built such as with the plastic portholes while the 12.8’s are a mix of high and low. The 44’s have higher quality hardware. The cockpit is safe with the classic offshore arrangement of a bridgedeck (on Whitby’s), deep well, and stout scuppers. The 12.8’s have a companionway board that serves as a suitable replacement for a bridgedeck. Access is available from the center cockpit to the aft stateroom with fore and aft companionways. Whitby 42’s have a wicked weather helm, so an item to look for on them is a bowsprit which moves the sailplan and thereby center of effort forward. Some Brewer 12.8’s also have a bowsprit paired with a mast set inline with the forward bulkhead while the rest have a tall rig and keel stepped mast through the saloon along with a bow platform with keeps your anchors from chaffing the bow. 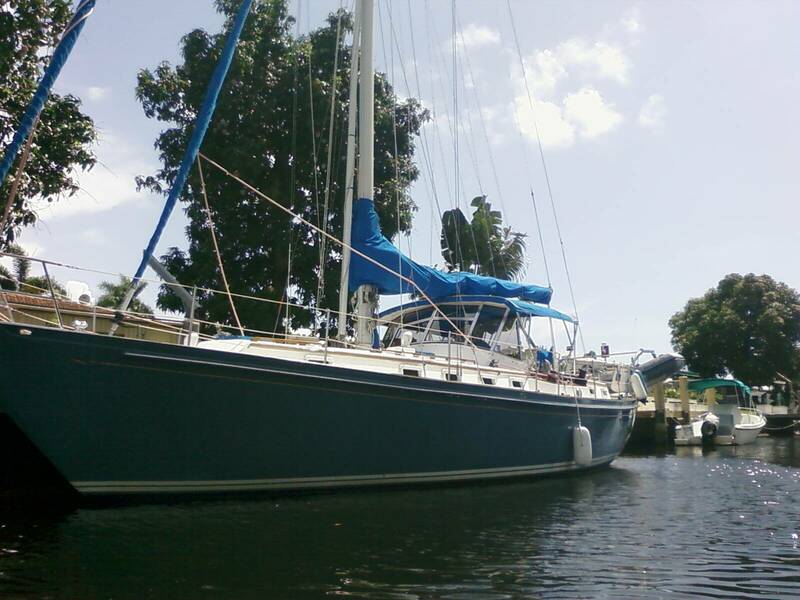 Interiors sell boats, and by whatever name this sailboat has a high demand layout. Paired with their spectacular performance, this is a killer combination. Starting forward is a v-berth with separate wet head. Aft is the main saloon with nice teak woodwork. The galley is port of the companionway while the navigation is starboard. The passageway aft has engine access alongside and lower headroom as you walk through. The aft stateroom is large with a full width king size berth and master head. The biggest difference between the 12.8 and 44 is the enlarged aft stateroom because of the swim platform. While both were popped from the same mold, the glassed on stern allows for extra storage aft. Some 12.8’s and 44’s have a separate stall shower in the master head, a nice feature when living aboard. The Whitby and Brewer 12.8 were commissioned with 67 HP Ford Lehman diesels. Brewer 44’s seems to have 85HP Perkins 4.236’s. Many have been repowered these days with Westerbekes and Yanmars. There is excellent access through the aft passageway and plenty of room for a generator. With the heavy displacement ratio of 300, the Whitby’s were great heavy air boats and not too bad in light air. The 12.8 and 44 are better sailing yachts, amazingly faster with for instance the 12.8 having a PHRF of 126 versus the Whitby’s 174 or 168 with bowsprit. The centerboard versions track well and have a balanced helm. Their comfortable motion in a seaway is an owner highlight. I shortly seatrialed a Brewer 12.8 in January of 2012 and was impressed with her steady helm, the ease of deploying the centerboard, and soft motion. The Brewer 44 and her sisters the 12.8 and Whitby 42 are solid, classic cruising sailboats from the 70’s and 80’s. These days they are reasonably priced and worth a look if you are in the market for a center cockpit yacht in the $100,000 range. Comparables include the Bristol 41/43, Bristol 45, Gulfstar 44, and Hylas 44. Please see my popular list of 10 Best Center Cockpits for more. A better comparable to the Whitby 42 is the Morgan 41 Out Islander. If you own or sail aboard one of these Brewer yachts, please feel free to comment below; I would love to hear your experiences and feedback.